On Sunday, October 22, 2017, three club unicyclist, Rodrigo Sanz, Abdullah Wright, and myself set out from 161st and Grand Concourse for a 25 mile tour of the borough of the Bronx. First established in 1994, this event has continued to grow over the years to the point where this year there were approximately 7,000 registered cyclists. There are a litany of sponsors for the Tour de Bronx event, some provide funding some providing fuel, swag or volunteer participation. Enthusiastically leading this all day event is the Bronx Borough President, Ruben Diaz Jr. The Borough President gives an inspirational speech to launch the each branch of the tour. The 25 and 40 mile tour routes scenically wined their way through the Bronx on the streets, through parks and cycling paths. There are a few rest stops along the way where tour sponsors provide water, bagels and protein bars. The circular route ends to a big welcome rally at the New York Botanical Garden we were welcomed by a live musical performance, Dominos pizza, water or energy drink and free Tour de Bronx t-shirt. It really is a fun ride that I have had the opportunity to participate in this tour for the third consecutive year. Throughout the ride we receive a lot of awesome support for the sport of unicycling from our fellow cyclists. This year we were almost excluded from riding due to a misunderstanding of unicyclists ability to ride long distances by the tour's organizers. 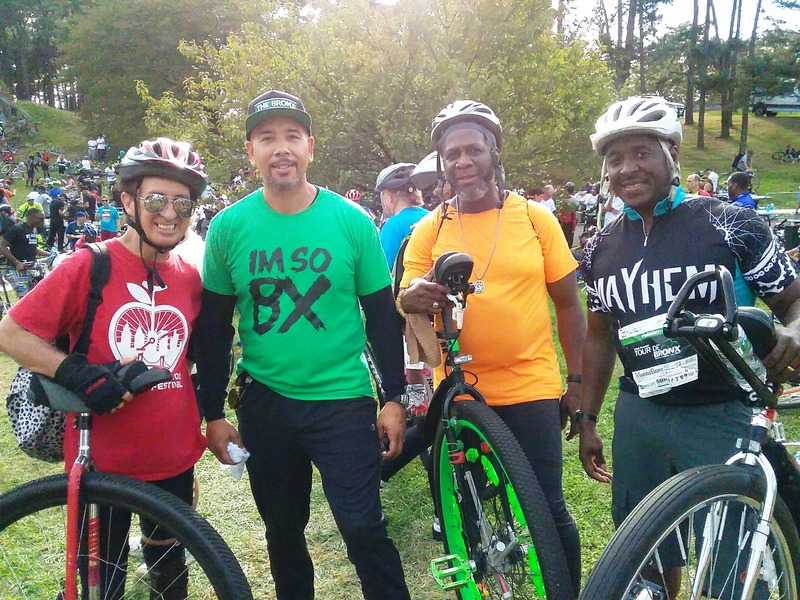 We like to thank Olga Luz Tirado the executive director of the Bronx Tourism Council for patiently listening to the three of us collectively lobby for our inclusion by pointing out how we have been participating in supporting cycling in the Bronx by completing this event multiple times. Seeing the photo albums of previous tour events on our Flickr site, sealed the deal. In addition to the photo above, you can check out additional photos recorded at this year's event by clicking on the photo above or following this Flickr link. In addition, The photo below of our participation was included in an online article on the Riverdale Press website. My thanks to their Chief Photographer, Julius Motal for including us in the following photo that links to the Riverdale Press article. You can enjoy more of Julius' work by checking out some of Julius' blog posts.